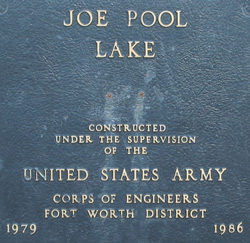 Joe Pool Lake is the end result of more than 25 years of planning and over a decade of construction. The U.S. Army Corps of Engineers, the Trinity River Authority, the Texas Parks and Wildlife Department, and the Joe Pool Lake Planning Council all collaborated to plan and construct the Reservoir. Once the lake opened in 1989, Joe Pool quickly become a favorite destination for residents of the Dallas - Fort Worth Metroplex. Today the lake and the amenities found along its shores allow visitors to enjoy a wide variety of outdoor recreational pursuits. Whether you prefer to go bird watching or fishing, jet skiing or barbecuing, or like to spend time in your boat or your camper you can find everything you need to have a great time at Joe Pool Lake. This website is designed to help you learn about Joe Pool Lake and provide information that can help you plan your next visit. Continue reading this page to obtain a general overview of what Joe Pool has to offer, use the navigation links on the left to find out more detailed information about the topics listed there, or jump around to various topics by clicking on the links that are found in the text below. This 1,826 acre park, managed by the Texas Parks and Wildlife Department, is located along the northeast corner of Joe Pool Lake. The park entrance is located off of F.M. 1382. Cedar Hill State Park has a marina, numerous boat ramps, a fishing barge, hiking trails, a mountain biking trail, and a swimming area. There are over 300 campsites, some located right along the shore of Joe Pool Lake, and hundreds of picnic tables and barbeque grilles. Loyd Park (many people mistakenly spell the park name as Lloyd Park) is managed by the city of Grand Prairie. The park is just east of SH 360 and its entrance is located off of Ragland Road. This park's 791 acres provide visitors with access to campsites, boat ramps, a boat dock, a beach, hiking trails, an equestrian trail, picnic facilities, a softball field, and a volleyball court. Lynn Creek Park, like Loyd Park, is also managed by the city of Grand Prairie. This 785 acre park is located along the northwest corner of Joe Pool Lake and is accessed from Lake Ridge Parkway. You can find a boat ramp, a beach area, a concession stand, group and single use picnic sites, and sand volleyball courts. Lynn Creek Park is a day use facility that is open from March through October. The final park of note is Britton Park. Its primary purpose is to allow boaters easy access to the southernmost reaches of Joe Pool Lake. For a $5 fee (per vehicle, per day) you can use the boat launch and park your rig in the parking lot. There is also a restroom located adjacent to the parking lot. A full service marina with boat slips, boat rentals, gas, a a boat ramp, a marina store, a restaurant, and more. You can call 817-640-4200 to inquire about their hours and fees. Joe Pool Marina has shut down and is no longer in operation. Camping at Cedar Hill State Park or camping at Loyd Park are both nice options if you want to spend more than a day at the lake. It is important during the summer that you make reservations in advance, especially during the weekends and on holidays. 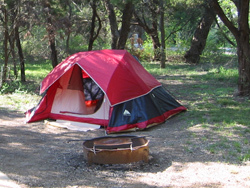 Both of the links above will take you to a page with all the details you need to know about camping in either of these two Joe Pool Lake parks. Largemouth bass, white bass, white crappie, and channel catfish are the primary sport fish in Joe Pool Lake. When it was built much of the brush was removed from the lower (north) end of the lake. Along the upper arms, where Walnut Creek and Mountain Creek flow into the lake, a lot of cover was intentionally left in place to provide good fishing habitat. Information about fishing regulations, the layout of the lake, and more details about fish structure in the body of the lake can be found the Texas Parks and Wildlife Joe Pool Lake webpage. There are a total of 7 boat ramps scattered around the lake: two at Cedar Hill State Park, two in Lynn Creek Park, one at Lynn Creek Marina, one in Britton Park, and one in Loyd Park. Your entry fees to get into each of the parks allows you to access their boat launches. 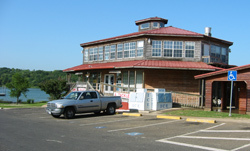 For using the Lynn Creek Marina boat launch, you need to pay at the Marina store. The lake has a surface area of 7,400 acres when full and has over 60 miles of shoreline. Joe Pool Lake is fed by the waters of Walnut and Mountain Creeks. The lake is one of the few in Texas that flows north. This is pretty lucky, considering the continuation of Mountain Creek empties into Mountain Creek Lake. This other lake is quite polluted from a now closed airfield that lies along its shores. The gates of the lake were first closed in January of 1986. The lake was full and officially opened for business (fishing and recreation!) in August of 1989. Other places where you can visit and relax!